Wimbledon is nearly upon us again and the nation is wondering can Murray do it again? After years of not having a British a Wimbledon men’s champion, Murray managed the impossible in 2013, but then in the 2014 championship, Murray was despatched by Grigor Dimitrov in the quarter finals. Andy Murray won the Queens title yesterday, for the fourth time, so maybe he’s with a crack at the Wimbledon title this year. In the meantime, here are ten things about Andy Murray that you may not have known. An eight year old Andy Murray was attending Dunblane Primary Schools when the killer, Thomas Hamilton shot and killed 16 children and a school teacher. Murray knew the killer because he attended a youth club that Hamilton ran and Murray’s mother, Judy, often gave Hamilton lifts in her car. Andy Murray never drinks alcohol. He has been completely teetotal ever since a night time binge when he was young. Murray had a night out on the town in Barcelona, where he was attending tennis camp aged 16, and he had one or two too many to drink. He made himself physically sick and was so embarrassed by his behaviour that he has never drunk since. When Andy Murray beat his tennis playing brother, Jamie, for the first time, Andy was not exactly modest about his victory. The then 10 year old Andy, taunted his brother so relentlessly about the game that Jamie lost his temper and slammed his fist down on Andy Murrays left hand. Murray still has a scar on the ring finger of his left hand from the incident and the nail on that finger has never grown again. As a part of his high protein nutrition programme, Andy Murray has been known to eat 45 pieces of sushi in a single sitting. He also fortifies himself with a bowl of porridge oats for breakfast on the morning of every single major match that he plays. The reason that you see Murray holding his knee in pain so often in tennis tournaments is that he was born with a defect of the kneecap known as bipartite patella. This condition, diagnosed in Murray when he was 16, means that his kneecap has remained as two separate bones rather than joining together as it should have done. Unlike many sports people, who have many different rituals and superstitions that they follow before big games, Murray is said not to be overly superstitious. 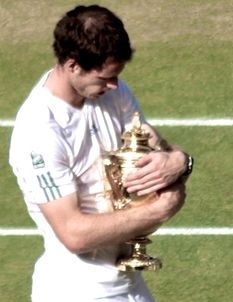 His one big superstition though, is that he will not hold any tennis trophy that he has not actually won yet. He won’t hold any trophy or medal before he has won it for fear that doing so will bring him bad luck. Andy Murray is very proud of his Scottish heritage, but he does have some English blood in him, albeit a few generations ago. Murray’s maternal grandmother, Eileen Shirley Edney, was of English descent, her parents having come from Berwick-Upon-Tweed and York. Apparently Andy Murray is not averse to taking a turn on the karaoke machine. He’s said to be a big fan of the singing machine and in 2010, during the French Open, he donned an Afro wig and belted out the Jackson Five hit, I Want You back. When asked about his performance, he said ‘The singing was OK, but the dancing was rubbish’. 9. He’s not short of a few quid! Andy Murray’s net worth is currently estimated to be in the region of $70 million and he earns around $15 million a year. The prize money for his winning 2013 Wimbledon Championship alone was £1.6 million. 10. What are the odds of Andy Murray winning Wimbledon 2015? Andy Murray is definitely on form and the British crowd will be behind him again. If you do fancy a flutter, the bookies are currently offering 11/4. The odds on a Murray win were dramatically shortened after his convincing win at Queens.